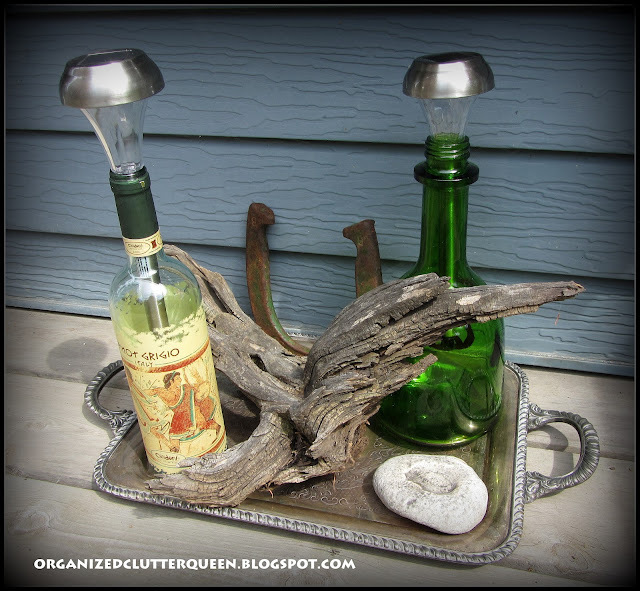 Don't you love Debbiedoo's Copycat parties? It's a challenge, but a fun challenge. I have been searching for a magazine or blog inspiration to copy with not much luck, when our local newspaper arrived last week with this "Simply North" magazine insert. 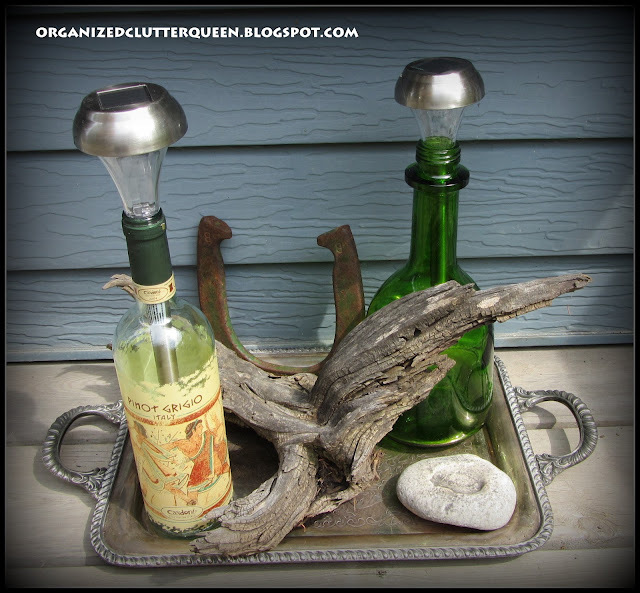 It had this easy outdoor vignette with two wine bottles and solar yard lights, a piece of driftwood, a rock, and a horseshoe. 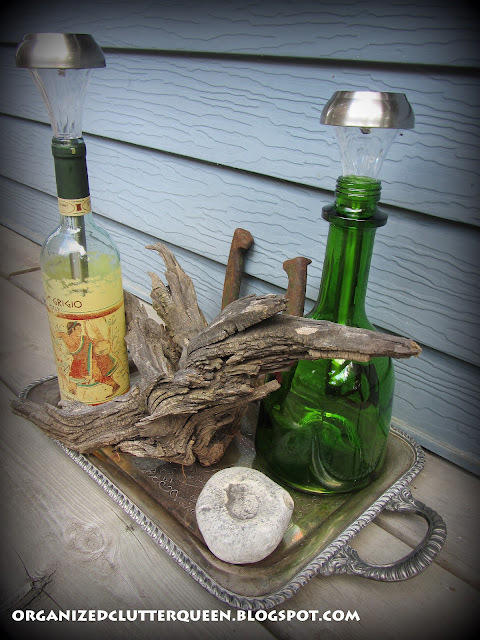 I situated my vignette on a tray. My driftwood was much smaller than my inspiration photo but I think more interesting. It has been sitting in my flower garden for years. My rock is actually a fossil. See the imprint in the top. Here is my copycat vignette lit up at night. 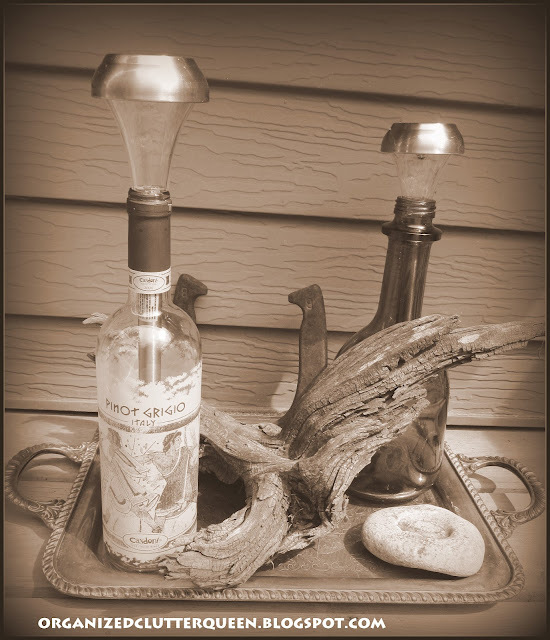 I played around on Picasa with these photos and came up with a sepia version that I liked even better. That's my copycat challenge entry! Don't forget to enter my Ramsign house number sign giveaway on the sidebar. Oh I love the sepia version. 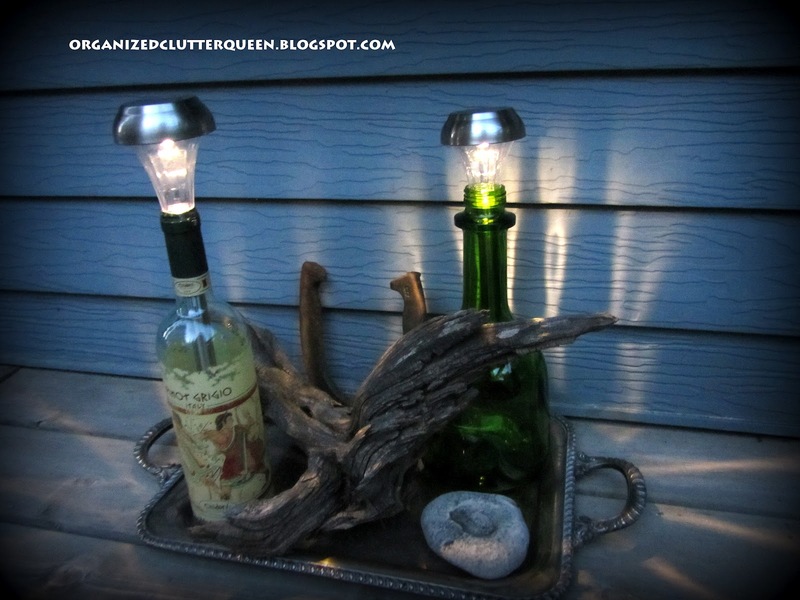 I also like the idea of putting the solar lights in bottles!! I have heard of using the solar lights whe you have a power outage. To bring them inside at night or lights. When you loose power for days like we do......putting them in the bottles would make them even better. Those are really beautiful! I made some solar light jars this week. Never thought about using wine bottles! Great project! That is really neat...Love the sepia look! Oh Carlene, I love it! I actually prefer yours to the original. Ya did good! Nah. I'd say you did better. Way better. love this.. your copy is terrific~! Oh my gosh Carlene..that is so cool! What a great copy cat. Thanks so much for sharing with the copy cat party. Enjoy! This is an awesome project! So creative! I hate to tell you, but I may be copying your copycat if that is ok with you! LOL Love, love your your copy! well, and what a great version yours is! what a neat idea, i'm really glad i saw this!